Derek STEPAN. "Rookie Silhouettes". 2010-11 Panini Crown Royale. ANY INPERCTIONS YOU MAY SEE, ARE FROM THE TOP LOADER OR PENNY SLEEVE. ALL CARDS ARE IN MINT OR BETTER SHAPE . (CANADA & USA ONLY) Cards are sent in a plastic card protector. 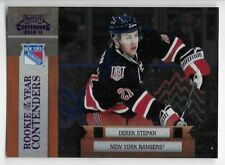 You are looking at a 2010-2011 Panini Playoff Contenders Rookie of the year Contenders,Derek Stepan #2, 49/50 SP. What a great card for the rookie card collector. Get this card while you can find it. THIS ITEM IS UNCONDITIONALLY CERTIFIED 100% GENUINE BY THE MANUFACTURER! THIS 100% AUTHENTIC CARD IS A VERY UNIQUE AND INCREDIBLE COLLECTIBLE ! IT DOES NOT GET ANY BETTER THAN THIS. ONE OF A KIND! 2010-11 DOMINION ROOKIE PATCH AUTOGRAPH RPA #242 DEREK STEPAN 34/99 !! 2011-12 Panini Titanium New Wave Justin DiBenedetto Autograph #35. 2011-12 Panini Titanium New Wave Calvin de Haan Autograph #43. You are purchasing a 2010-2011 Panini Dominion Derek Stepan Autographed Jersey Patch Rookie Card. Card #242. The card is serially numbered 19/99. 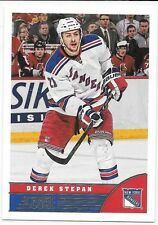 You are purchasing a 2010-2011 Certified Derek Stepan Autographed Rookie Card. The card is serially numbered /499. Card #197. Let's get that album finished! I look forward to serving your 2018-19 NHL Hockey Stickers Singles Needs. I am your BEST source for your NHL hockey stickers sets and singles. Where it all started in 1998. You are purchasing a 2010-2011 Limited Derek Stepan Autographed Patch Rookie Card. Card #213. The card is serially numbered 033/299. You are purchasing a 2010-2011 Certified Derek Stepan Autographed Mirror Red Rookie Card. The card is serially numbered /100. Card #197. You are purchasing a 2010-2011 Certified Derek Stepan Autographed Mirror Blue Rookie Card. The card is serially numbered /50. Card #197. Near mint to mint condition, no creases or other problems. Card in the scan is the exact card you will receive. Shane's Sports Cards. Larger Sets-Vary by weight. Card in title is the actual card you are purchasing. 72 Card Unique Derek Stepan New York Rangers Jersey & Insert lot. Several variations. 2010-11 Panini Pinnacle Ice Breakers Rookie Signature Derek Stepan Autograph RC #255 11/199 2010-11 Score Rookies and Trade Derek Stepan RC #565. Let's get that album finished! I am your BEST source for your NHL hockey stickers sets and singles. I look forward to serving your 2018-19 NHL Hockey Stickers Singles Needs.